Different MediaTypeFormatters for same MediaHeaderValue in ASP.NET Web API | StrathWeb. A free flowing web tech monologue. 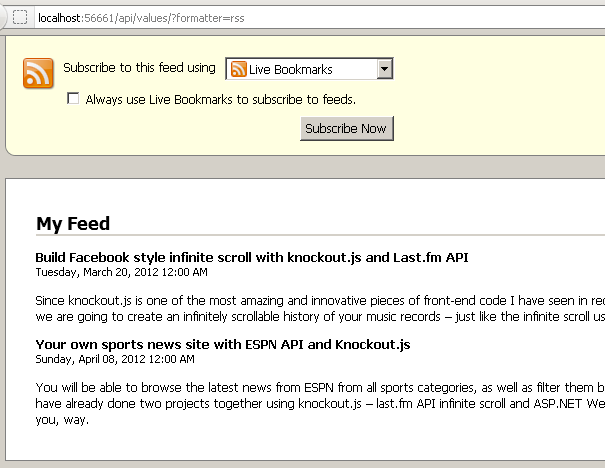 So last time we built a small Atom/RSS MediaTypeFormatter for the Web API. If you remember, we made it respond to requests with headers “application/atom+xml” and “application/rss+xml”, and set that in the GlobalConfiguration. That means that all the ApiControllers used that setup (so all requests with these content type headers would go through this formatter). Now consider the following scenario (for brevity we are ditching Atom now and concentrate only on RSS). You have this nice RSS MediaTypeFormatter, yet in order for it to be used the client has to issue a request with “application/rss+xml”. You on the other, would like that MediaTypeFormatter to also be in use also when a user tries to get your RSS via the web browser (content type request “text/html”). Let’s stop for a moment and add a new controller to the project (we are using project from last post as the start base), and call it RSSController. We will copy to it our repository property and two main Get() methods – to get all and get single model. Again, in that case, the request will have a Content type “text/html”, and if you plain and simple add this content type handling to the MediaTypeFormatter it would handle all such requests with the RSS formatter, you just want the ones coming through RSSController. In other words, you’d like to handle the same content type with different MediaTypeFormatters, if they come through different controllers (routes). Unfortunately, as mentioned, per-controller configurations are not supported yet, but even in beta, you still have some tools at your disposal that would help you to differentiate requests, and achieve what has been mentioned. To start off, we need to tell our MediaTypeFormatter that we will support “text/html” requests as well. To do that we overload the formatter’s constructor and add this new MediaTypeHeaderValue there. Notice we used a generic argument, so that we can facilitate anything else as well, not just “text/html”, and we call AddUriPathExtensionMapping, telling the formatter to support the extension “rss”. Right now what we need to do, is register our MediaTypeFormatter, but specifically for the “text/html” MediaHeaderValue (in Application_Start(), global.asax). Since GlobalConfiguration by default gets 3 predefined Formatters (JsonMediaTypeFormatter , XmlMediaTypeFormatter, FormUrlEncodedMediaTypeFormatter), we want to keep them, and just insert one in front of them, hence we use the insert() method on the Formatters collection. The final thing to do is to Register some routes that would allow us to make requests to our application with URIs that have an .rss extension. We have two routes, cause we want to be able to request also individual items with rss extension. This is no news since this is how our controller behaved last time. 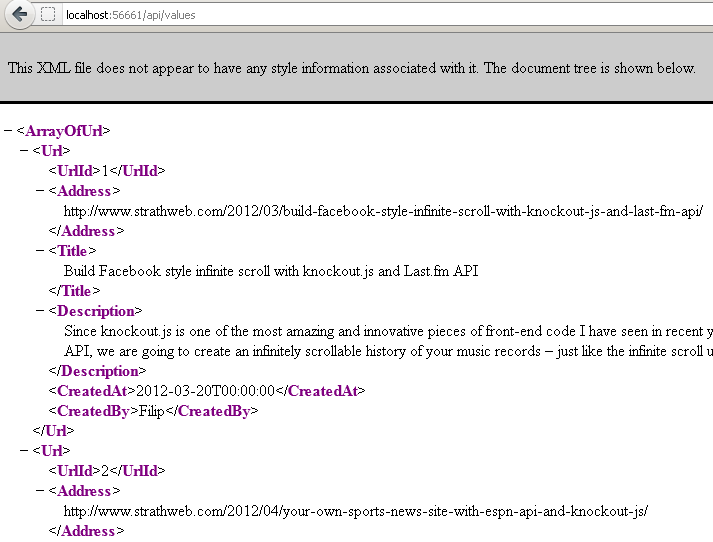 Notice that in this case “text/html” request is handled by XmlMediaTypeFormatter. 2. calling /api/rss.rss and /api/rss/1.rss with content type “text/html” – our models in RSS format since only *.rss requests will spit out the models through our custom MediaTypeFormatter for this content type. All other requests with “text/html” would use GlobalConfiguration defaults (as in point 2). Now this is something! We can easily see that our extension specific MediaTypeFormatter works like a charm. 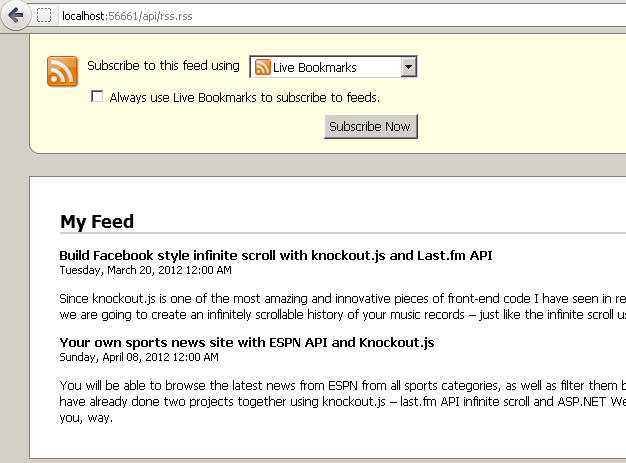 It is not only extension specific (.rss) but also content type specific at the same time (“text/html” only). So – same MediaHeaderValue, but different formatter in play! This way we showed, it is easily possible to use different MediaTypeFormatters for same content type, even without support for per-controller configuration. This is a bit less elegant option, since it would require your clients’ requests to contain QueryStrings, but it works very well. In principle, responses from our ApiController will be formatted by Default formatter (whatever it is in the GlobalConfiguration Formatters collection at the moment), until you pass an API request with a QueryString parameter. If it matches the settings predefined in the QueryStringMapping of your MediaTypeFormatter, that formatting will kick in. All that’s needed to enable it is to add a call to AddQueryStringMapping() in the constructor of the MediaTypeFormatter, and specify the QueryString key and value to be expected. Notice that AddUriPathExtensionMapping and AddQueryStringMapping can easily run side-by-side, since one deals with extension in the URI and the other with QueryString. Again let’s run all some examples. Again, the default behavior remains unaffected. As you see, there is quite some flexibility in formatting the responses from ASP.NET Web API, and even though the per-controller Configuration is not currently supported, you can still do quite a lot very easily (out of the box) with things like PathExtensionMapping and QueryStringMapping. Have fun.